Melbourne has experienced a steady population rise to well over four million people, and an accompanying demographic shift is occurring as space in inner-city areas are increasingly under commercial pressure. 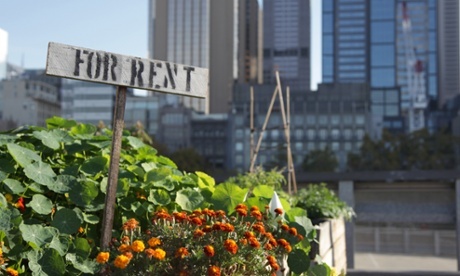 For a growing number of urbanites, community-based gardening projects are providing a much-needed connection to both local communities and the earth. A sign at the entrance to Veg Out reads: “Gardening is an act of faith in the future.” Apart from the ocean of artfully decorated garden beds, the first thing that hits you when you walk into this prospering St Kilda community garden is the smell of fresh compost mingling with the sweet and pungent whiff of fresh herbs and vegetables. Yet it has taken more than just faith to ensure the survival of this former bowling club on the site on a $30m-plus piece of land right next to the famous Luna Park and just metres away from the St Kilda beach foreshore. Garden co-ordinator Rob Taylor says the garden initially encountered a lot of scepticism that it would be able to survive in such a prime commercial location, but he says the key has been hard work and always remaining open to the public. Veg Out is financially independent (mostly through funds generated from a monthly farmers’ market) and hosts more than 150 garden plots on just under two acres, all set to the sounds of the Big Dipper rattling away in the background. It features affordable artists studios, a wood-fired stove, live music stage and children’s playground. Sitting between skyscrapers and train lines on one side and the Birrarung Marr park and Yarra river on the other, the site boasts 120 plots that consist of composted soil inside former fruit and vegetable crates. For about $3.50 a day, many of the crates are taken up by city restaurants such as the Taxi Dining room, Little Creatures Brewery, andthe Press Club to grow fresh specialty garnishes and edible flowers such as borage, nasturtiums and violas. 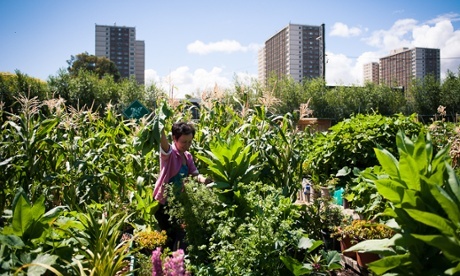 In the shadows of Melbourne’s concrete, almost Soviet-style housing commission flats, around 800 mostly refugee and migrant gardeners share 19 inner-city community gardens through a project called Cultivating Community. Each garden hosts between 12 and 126 plots, depending on location. To apply for a plot, you need to be a public housing tenant. At one of the larger gardens in Highett Street in Richmond, I meet Domingos Mac, an East Timorese mother who has gardened here for over 20 years. “I have more time now that the kids have grown up, but I’m not as fit as I used to be,” she says. She shows off her crops of taro, white cucumber, gai lan (Chinese broccoli) and aloa vera. “These ones are good for blood pressure, circulation and skin infections,” she says casting her hands across verdant, fecund garden beds. 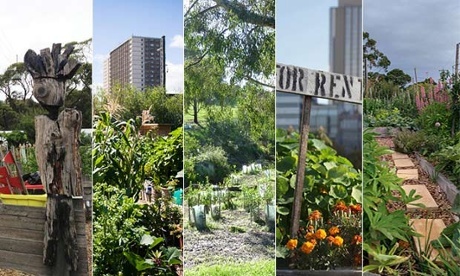 According to Cultivating Community project manager Sharelle Polack, one of the extraordinary things about the public housing gardens is how the diverse backgrounds of the gardeners is reflected in the biodiversity of the crops. 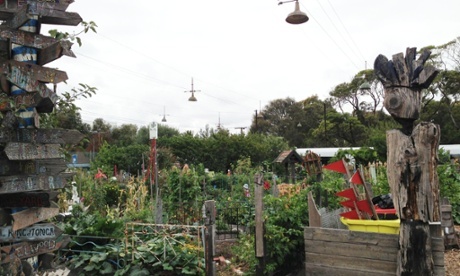 Tucked behind a grassy knoll beside a curve in the railway track between Rushall and Merri railway stations, Rushall Garden was formed a decade ago by local residents after six years of negotiations with the Yarra council. 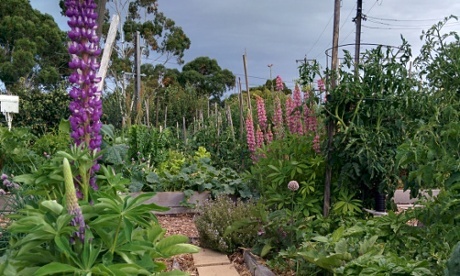 It houses 62 garden beds and provides communal plots for people on the waiting list. Despite sitting in the midst of one of Melbourne’s most gentrified areas of the middle-class inner-northern suburbs, Rushall gives priority to low-income residents with no garden of their own. The site features composting toilets and water tanks that gather run-off harvested from a nearby electrical substation roof – and has also recently become an official composting hub for local cafes and restaurants to bring their food scraps. For those who don’t want to wait for a plot in an established community garden, a quiet revolution is taking place along Melbourne’s waterways. Here an active movement of local gardeners are taking matters into their own hands by revegetating eroded creeks with indigenous plants. According to Patrick Belford, freelance landscape gardener by day and part-time guerrilla gardener, “the key philosophy behind the planting is the attitude of being custodians of the land”. The aim is to combat the erosion of creek banks and suppress weeds while providing a habitat for birds and other wildlife. “There is a very strong underground community around revegetation. It’s restorative for both people and the environment. 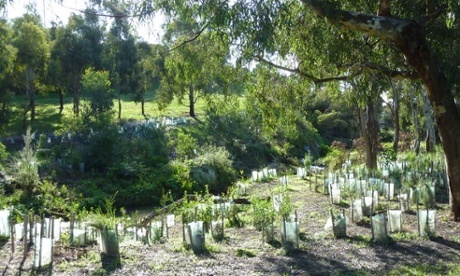 For example, planting days for the Friends of Edgars Creek in Melbourne’s northern suburbs occurs every month, and these events are always popular. The group and sense of community is re-enforced by the observation and care of the plantings already established,” says Belford. ← Why is non-monogamy such a dangerous idea?